On the left you can see Wilf Forrow who has led our efforts. He’s standing next to the replacement sign at the south end of the Billy Trail. You can see how much they’ve faded over time. The new signs have better UV protection so should last longer. 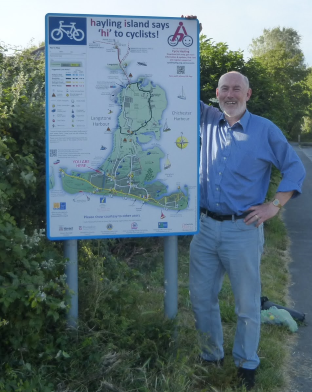 And here’s the new sign at the top of the Billy Trail. 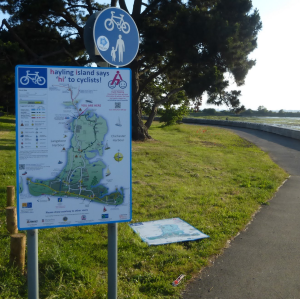 We’ve got two further signs to display and we’re looking to place them at Beachlands and Eastoke. We’ll let you know when they go up. 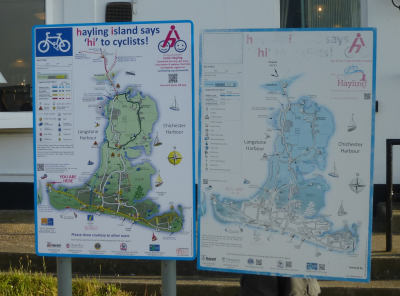 The new signs come with a supporting web page – designed for use with smart phones – to provide visitors with more information than we can show on the maps. Thanks again to all our supporters for voting for us – and to Hampshire County Council for running the ‘Approved by you scheme’. Very glad they’ve been replaced. When you say Eastoke, do you mean Eastoke Corner? Also, where at Beachlands? Precise locations to be determined.